Sean Connery was, as is well known, born as Thomas Connery on 25th August 1930 in Edinburgh. His parents, Joseph Connery and Euphemia McLean, lived in Fountainbridge, an area at that time dominated by breweries and rubber works and the actual location having long been demolished. Joseph Connery himself worked in the rubber works and his wife, whom he had married at Tynecastle (close to the famed Heart of Midlothian football ground), had before her marriage been employed in a laundry. Nothing in this background suggested that the son would have such an illustrious career ranging from milkman with St. Cuthbert's Co-operative Society to an extra in the London staged musical 'The Sound of Music' and to becoming known as the Greatest Living Scotsman and receiving the ultimate accolade of being knighted by the Queen. The Connery family was of Irish origin. Joseph Connery was the illegitimate son of a pedlar, of whom little is known. This earlier Thomas was neither born nor married in Scotland, although on his death in Edinburgh in 1949 he was described as having been the 70 year old widower of Jean McNab, Joseph's mother. A further son had been born to them in 1905, at which time they were still unmarried. His own parents had married in South Shields in 1863. It is not known when the Connery (also known at times as Connary) family settled in Edinburgh but they are not recorded there in any Scottish census in 1881 although a daughter, Elizabeth, had been born in Glasgow in 1870. Additionally, Elizabeth was employed as a cotton reeler in a jute factory in Dundee when she married there in 1889, suggesting a certain restlessness in these earlier generations. James Connery and Elizabeth McPhillips however both died in Glasgow. Sean Connery's paternal grandmother, Jean McNab, had also been born out of wedlock, in 1878, her parents being John McNab (a letterpress printer's engine keeper) and his housekeeper, Jeanie Allison. It was not until after John and Jeanie married in 1891 that young Jean's birth was registered, showing that it was still possible at that time to slip through the official net. John McNab was an elderly dad, he had been born on New Year's day in 1819 and was thus 59 years of age when his daughter was born; he had however been previously married and had offspring from that marriage. He died in 1896 from septicaemia, the result of a lacerated hand wound but had this accident taken place in the post-antibiotics era, he may well have survived it. Although McNab is a Highland name, John too had been born in Glasgow and George, his father, was also born in Lanarkshire, around 1790. On his marriage to Elizabeth Reid (Glasgow again) in 1817, he was said to have been a 'servant'. This couple had seven sons but the records do not tell us how many brothers George himself had, nor do we know if any of his sons went on to fulfill the prophecy of seventh son of a seventh son. On the distaff side, Sean Connery's mother, Euphemia McLean was of solidly Scottish stock. Although her father, Neil, was Edinburgh born, he worked as a platelayer on the railways in the Fife town of Dysart in Fife , where he married Helen Ross in 1908. Here the Highland ancestry becomes apparent as Neil's father, John, was a Skye man, born in Uig. His progress from Skye can be charted as he was a 30 year old merchant seaman at the time of his marriage in Leith in 1866, a labourer in Edinburgh when Neil was born in 1878 and a foreman labourer on the railways in 1891. Then he and his family were living in a railway hut near Arrochar in the west Highlands, the accommodation consisting of three rooms with windows and which the McLean family shared with three boarders who also labourered on the railway. The census details show that a daughter, two years younger than Neil, had been born in Campbeltown on the Mull of Kintyre. John was a Gaelic speaker but curiously, his wife, Euphemia McBain, although from the Fife fishing town of Pittenweem, was also bilingual in Gaelic and English. They had not however passed this ability on to either of their listed children, neither of whom were noted as speaking anything other than English. After the death of her husband in 1897, Euphemia was enterprising enough to set herself up on her own account as a 'hutkeeper for workmen', where she was found in' Crook Navvies Hut, Left band of Tweed' in Tweedsmuir on census night 1901. The still unmarried Neil was also listed, as were seven Irish boarders, employed in various capacities on the railway. Nothing further is known of the ancestry of John McLean, other than that his father was also John McLean and his mother, Janet Mathieson. John, senior , is believed to have been a soldier at one time. The death of neither was traced, both appearing to have died before the advent of statutory registration of births, marriages and deaths in 1855 (Scotland), thus the names of the previous generation cannot be established. Prior to that date, the main sources of information are the Old Parish Registers which vary considerably in content and quality, depending merely upon the diligence and abilities of the session clerks concerned. Those of the west highland parishes are particularly sparse in detail with no trace of the McLean family being found in the relevant records. Euphemia McBain, John McLean's wife and a curious anomaly, a Gaelic speaking Fifer, was born in either Pittenweem or Largo (the latter being the home of Alexander Selkirk the character on which Daniel Defoe based Robinson Crusoe) around 1838. Perhaps the Gaelic came from earlier generations who had followed the traditional Highland pattern of coming south in search of work and who had kept their native language alive within their family, or she could even have been taught it by her husband, a native speaker. At any rate, the McBain family were well established in Fife, Euphemia's father having been born in Ceres shortly before the end of the 18th century, as had her mother, Mary Gourlay. The grandfather was one Lachlan McBain who had married May Melvill in Ceres in 1793. Beyond that nothing is known for sure. The final strand in this varying tapestry is also of northern Scottish origin. Sean Connery's maternal grandmother, Helen Ross was a Perthshire lass, born at Grandtully in the parish of Aberfeldy in 1884. Her father, John Ross was a ploughman who had also forsaken his roots and come south from Banffshire and who married in Glasgow in 1883. John was living with his family at Glenaughter in Mortlach in 1861, his father, James being a native of Mortlach and his mother, Christina Ross having been born in the Aberdeenshire district of Glenbuchat. John's father, William, a crofter at Glenaughter, lived to the respectable age of 85, dying there in 1874. This line had also originated in Glenbuchat, with William, the son of William Ross and Christian Grant, being born there in 1789. 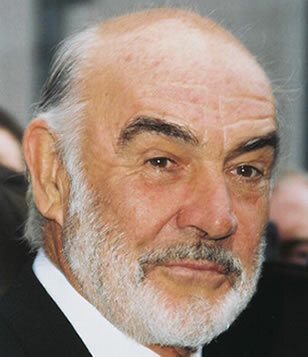 It is often said that current immigration trends will ultimately have a seriously diluting effect on the Scottish stock, but as can be seen in this picture of the ancestry of Sean Connery, Scotland has always had a good mix of bloodlines, with Highland, Lowland and Irish dominating in the melting pot. Scottish Roots was established in 1984 in Edinburgh to provide an ancestral research service for those who wish to discover more about their Scottish ancestors. We employ a team of researchers all of whom have at least 25 years of experience using records at New Register House, Edinburgh. ©2019 Scottish Roots. All rights reserved.